People wait in line for Lyon Books to open for its liquidation sale on Thursday morning. After 12 years in business, the downtown bookstore is closing its doors. It takes a lot of courage to swim against the tide, and for 12 years, operators of a plucky, independent bookshop did just that. But after various innovations failed to deliver overarching results, the owners of Chico’s Lyon Books are pulling the plug. Next to the proliferation of merchants offering tacos and bicycles, visitors to this small North Valley city often remark on the comparative abundance of bookshops. Those days are coming to a close. 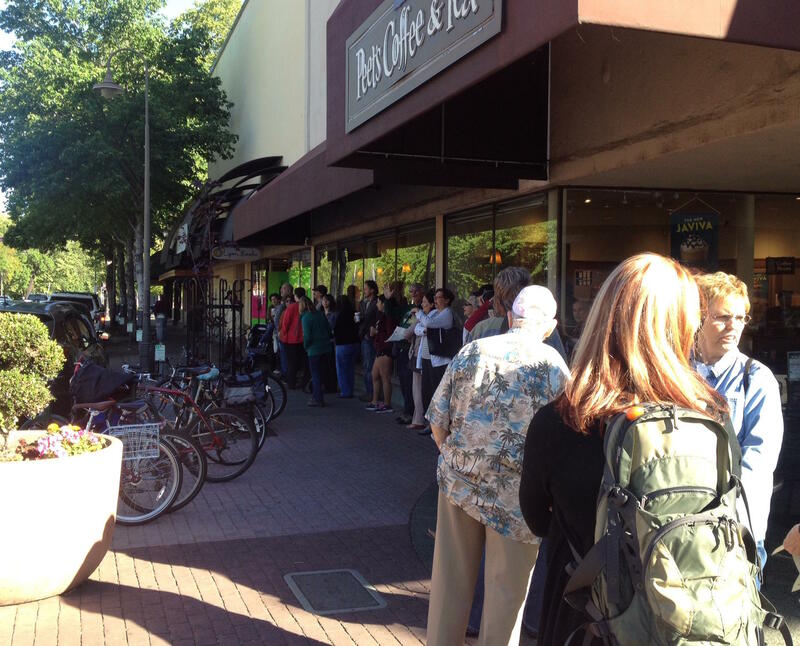 This morning, a store closing sale gets underway at Lyon Books. After focusing her energy on the shop for over a decade, co-owner Heather Lyon remains upbeat and positive, saying that while the book business wasn’t a ticket to riches, it was nevertheless supremely rewarding. Facing blistering competition from web-based booksellers seemingly capable of operating at a perpetual loss and the advertising muscle of national retailers, finding a niche in the sector isn’t easy. Dozens of storied independent bookshops have gone under in recent decades. Lyon tried adding other items, such as keepsakes, greeting cards, key chains and the like. Just two years ago it moved to a new, more visible location. It held readings by local authors and other events, offered tutoring services and hosted some community meetings. While all of those changes helped, Lyon said it seems people are generally reading less. Increases in the number of people using e-books have also poached potential customers. And other forms of entertainment have grown in popularity. The long term trajectory, she said, hadn’t shifted. “The one-two punch of the economy and Amazon is just really more than we could take on,” she said. The sale, which started this morning, is aimed at selling off all inventory, fixtures and furniture and also saying thank you, but not goodbye. Lyon said she’s staying in the community and is mapping out a new venture.